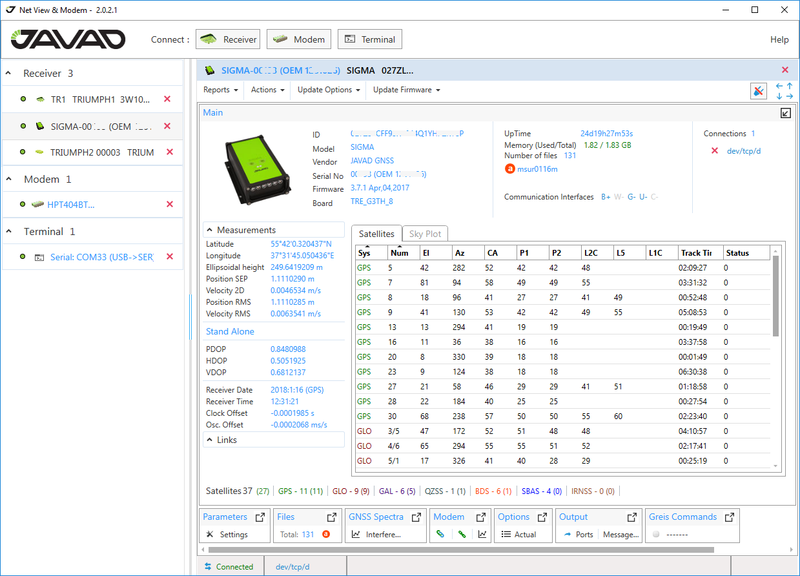 Net View & Modem is a free Windows application for controlling navigation equipment developed and manufactured by JAVAD GNSS. Net View & Modem completely includes Net View features. Directly connect to the receiver(s), using one of the following interfaces: serial, USB, TCP/IP (through the Ethernet ports or Wi-Fi adapter), Secure TCP/IP (SSL/TSL), Bluetooth. Displaying of the total number and the status of all visible and tracked satellites. Displaying the receiver current position, time and other measurements in real time. Satellite sky plots and orientation plots. Clear NVRAM, receiver reset, return to the initial parameter values, initiation file system, reset RTK. Create general, parameters and options reports. Update Firmware online from Javad website or from a file. Loading Options online from Javad website or from Option Authorization File. Setup of various parameters of receiver using graphic interface or command line. Start and stop file recording, deleting files, downloading files using file manager. Configure inner modems using graphic interface or command line. Update Inner modem Firmware online from Javad website or from a file. Pairing with the Outer modems. Manual mode terminal allows sending commands with prompt tip and view receiver response. Collecting and display GNSS and Radio Spectra. Support for multiple connections to the receiver for optimized simultaneous work. Directly connect to the modem(s), using Serial or USB interface. Directly communicate to the devices(s), using one of the following interfaces: serial, USB, TCP/IP (through the Ethernet ports or Wi-Fi adapter), Secure TCP/IP (SSL/TSL), Bluetooth. Windows 10, Windows 8.1, Windows 8, Windows 7 SP1, Windows Vista SP2, Windows Server 2016, Windows Server 2012 (64-bit edition), Windows Server 2008 R2 SP1, Windows Server 2008 R2 SP1, Windows Server 2008 SP2.